Violist Steve Larson is a Senior Artist Teacher at The Hartt School of the University of Hartford, where he has taught since 1998 and has served both as Chair for Strings and Chair of Chamber Music. He is a founding member of the acclaimed oboe, viola and piano trio, Ensemble Schumann, and the equally renowned Adaskin String Trio. He also performs and records in duo with his wife, violinist Annie Trepanier and throughout the Americas and Europe with their chamber groups, Avery Ensemble and Cuatro Puntos. Both groups also present their own Hartford, Connecticut concert series which present numerous world premieres and cross-cultural collaborations in programs specially crafted to give the music a meaningful context. 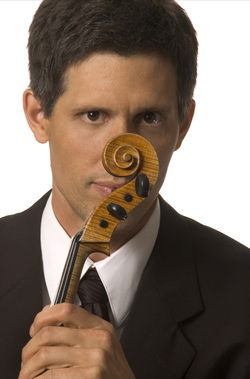 Larson is Principal Viola of the Wintergreen Festival Orchestra and Chair of Viola Studies for the intensive string chamber music program at the Wintergreen Summer Music Academy in Virginia. He is a former member of the Alcan String Quartet and has performed as a guest with groups such as the Emerson Quartet and the Lions Gate Trio as well as with orchestras such as the Montreal Symphony and National Arts Center Orchestra. Originally from Regina, Saskatchewan (Canada), Larson holds degrees from McGill University, l’Université de Montréal and The Hartt School. At the 1997 Lionel Tertis International Viola Competition in the United Kingdom he won second prize and received the special award for his performance of the commissioned work. He studied violin with Ernest Kassian, Elman Lowe, Howard Leyton-Brown, and Mauricio Fuks, viola with Jutta Puchhammer and Steve Tenenbom, and chamber music with members of the Emerson and Orford String Quartets. He plays an exceptional 17-3/8 inch viola made by Helmuth Keller in 1981.